The Lake Garda area of Northern Italy comes highly recommended for its attractions as a holiday destination. It is situated in the North West of the country and has excellent road and rails links. Therefore it is conveniently located near major cities and towns such as Verona, Milan, Brescia and Bergamo. 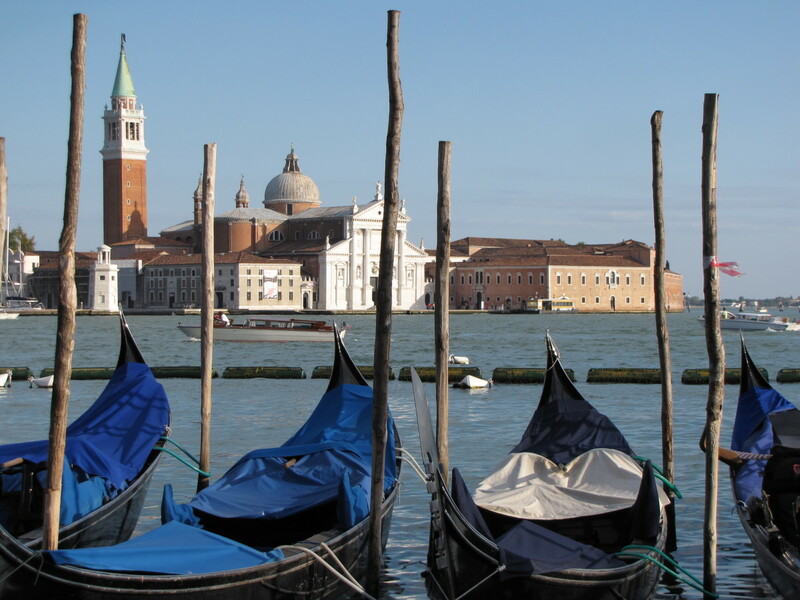 Even Venice on the Adriatic Coast can be easily visited on a day trip. There is a direct autostrada link and a regular express train service to the legendary Queen of the Adriatic. There are many places to visit on Lake Garda and also things to do with a rich variety of sights and activities.These offer historical interest, architecture and the natural beauty of its surroundings. Also wonderful food and wine, shopping, and of course lots of fun for adults and children. For example there are many campsites dotted around the shores and several theme-parks for families to enjoy. Overall there is something for everyone on Lake Garda and its delights can be appreciated not only by families but by young adults, romantic couples and senior citizens. There are countless interesting and exciting places to visit on Lake Garda. There are also ferry boats plying their trade across the lake during high season and they call in at all the major towns. They are a little expensive but ideal for escaping the horrendous traffic jams that can block the busy lakeside roads. Driving around the lake at the weekend especially can be a frustrating experience on its narrow roads. 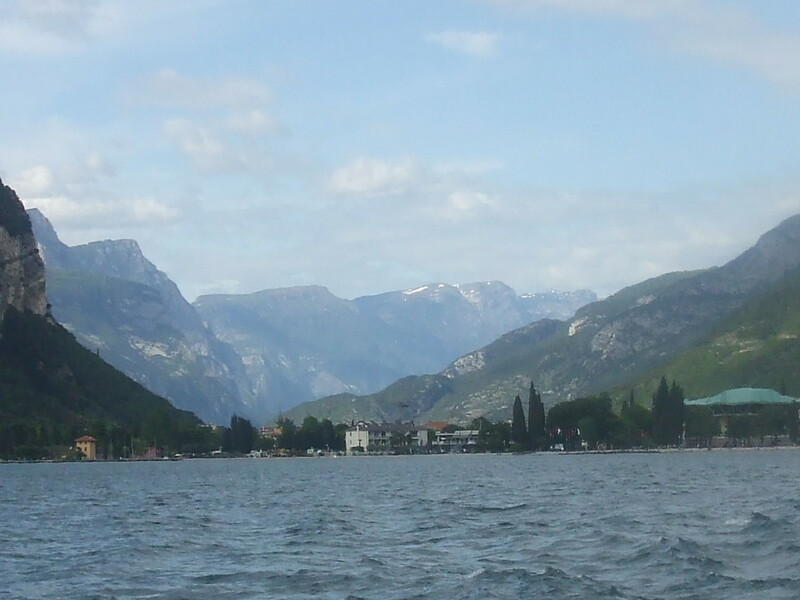 But don't let that put you off as Lake Garda is one of the best locations for a vacation anywhere in Europe. 1. Take a boat trip and marvel at the scenery around the lake. 3. Sample the viniculture around the famous Bardolino wine region. 4. Go trekking or climbing in the hills north of Riva del Garda. 5. Take the cable ride from Malcesine up to the top of Monte Baldo. If your budget is tight then there are bargains galore to be had from the plethora of quality campsites around the lake. For self-catering holidays the main towns contain cheap supermarkets but with tasty food and drink for all your shopping. Of course the lakeside towns have weekly markets but you'll usually find the best ones are inland where the prices are cheaper and more of the locals do their shopping. The goods and produce are less aimed at the tourist market than those on the lake and ideal if you have a car. Beginning with the largest town on the lake and a mecca for the fashion conscious, shoppers and lovers of good food and fine wine. It can be a vibrant and bustling town full of people in the late afternoon strolling along the promenades on their ‘passeggiatta’ past the many boats and yachts in the marinas. At night it is a very popular attraction for young partygoers and night-clubbers and many Italians flock there from the local area. 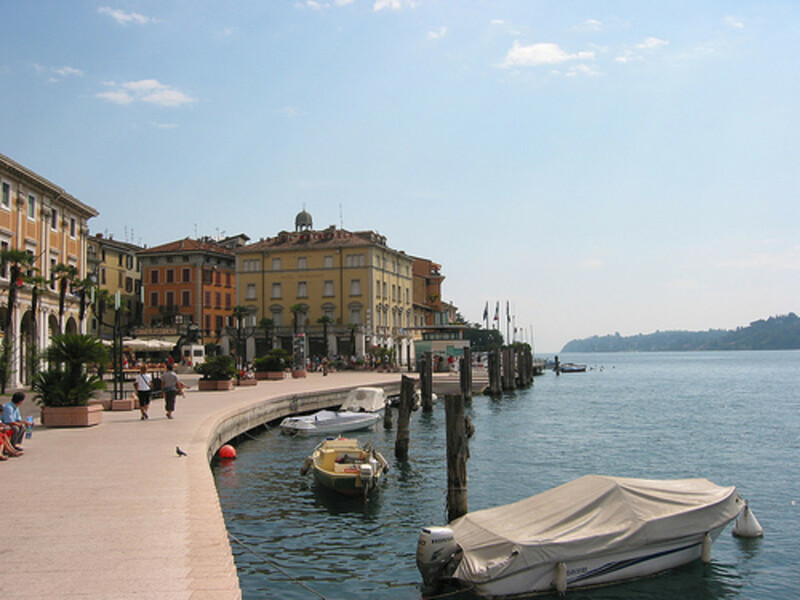 You will certainly find lots of things to do in Desenzano. It is an expensive place to spend your money unless you walk a little off the beaten track. And that is not bad advice as Desenzano is a pleasant town to wander around especially in its winding streets and pretty lanes. I would recommend a short walk up to the castle as it offers a beautiful view over the town and the lake. A perfect photo opportunity on a sunny day. There is even an Irish bar the 'Fiddler of Dooney' on the route if you fancy a pint of Guinness as a change from the Italian wine. There is also the excavated remains of a Roman villa as well as an agricultural museum for those with a passion for history. The town also has a railway station linked to Venice at one end and Milan at the other. By express train Venice can be reached in around one and a half hours, Milan in just under an hour. The station is about a kilometre inland and up a long hill but the local bus service takes you straight there. The town of Sirmione has Bronze Age origins from the 18th-16th B.C when villages existed on the peninsula on which it sits. It became a strategic position militarily as it sat between Verona and 'Brixia', the old name for modern Brescia. Fortifications were added in the 4th century A.D. and taken advantage of by the Heretics as a stronghold during the era of the Inquisition. It has a castle built in the 15th century by the Scaligeri family and actually used the existing Roman foundations on which to build it upon. It is very well preserved despite its age and the 'fish-tail' shape of the battlements lends it a strange fairy-tale appearance. But make no doubt about it, this was built for war and today you can see why as it's sited at the end of the thin peninsula jutting out over a kilometre into the lake. This afforded a comprehensive view and therefore complete control over the whole southern part of the lake. The fort is surrounded by a moat in which ducks potter about on top and large fish swim beneath them. Of course within the town you experience a mix of the ancient and the modern sitting side by side. Designer-clothes shops displaying 'Armani', 'Dolce & Gabani' and 'Versace' next door to souvenir shops selling trinkets, t-shirts and beach towels. But all are under the shade of the ramparts and old buildings within the fortified grounds. Cars are only allowed in for essential use allowing people to walk unhindered along the narrow streets and lanes at their own pace. Further east along the coast is the popular town of Peschiera. 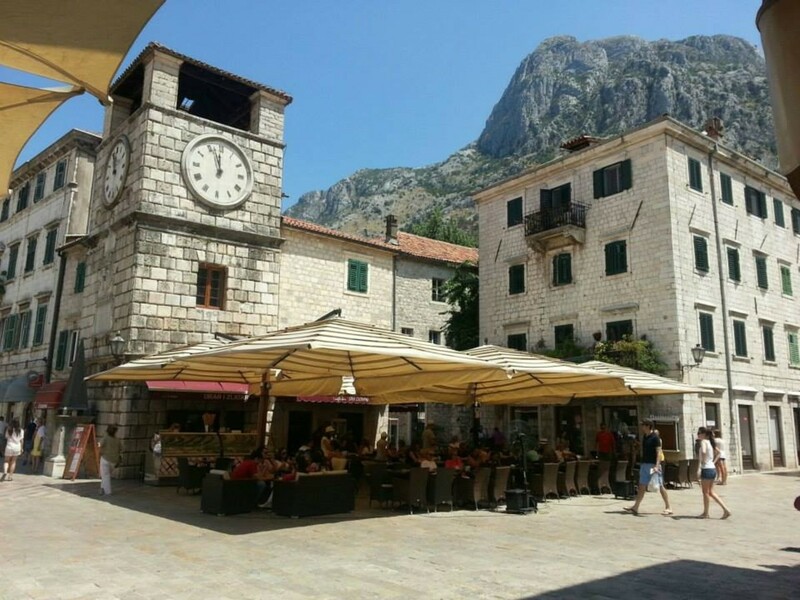 A lovely town, quite small and surrounded by enormous fortress walls dating from the 16th century. These were also built by the Scaligeri's of Verona with additional structures added by Venetians, Austrians and Italians over many years, including the architect Sanmicheli. The town actually dates from around 1400-1200 B.C. but contained a flourishing Bronze Age community long before then. Despite its size it became an important trading town as it had the geographical advantage of being sited at the opening of the River Mincio into which the lake flows. In 1974 the remains of a Roman settlement were found and these are on display in the town. The coat of arms of Peschiera contains two eels and a star because the Latin writer Plinio il Vechio wrote that when the 'autumn' star shines (i.e. Venus rising) eels would come to the area by their thousands and today eel fishing still takes place in the Mincio. Although the town clock is chimed by two eagles striking it with their beaks which might keep the eels away. The old military fortifications surround the town in the shape of a five-pointed star, like a particular geometric shape. Yes! there you go my friends, Pescheira had it's own Pentagon first. It is an excellent clothes-shopping town albeit quite expensive and an exciting venue for live music and entertainment. A large market takes place near the tourist information office on a Monday morning and it also has a few large supermarkets such as Lidl and Eurospar. 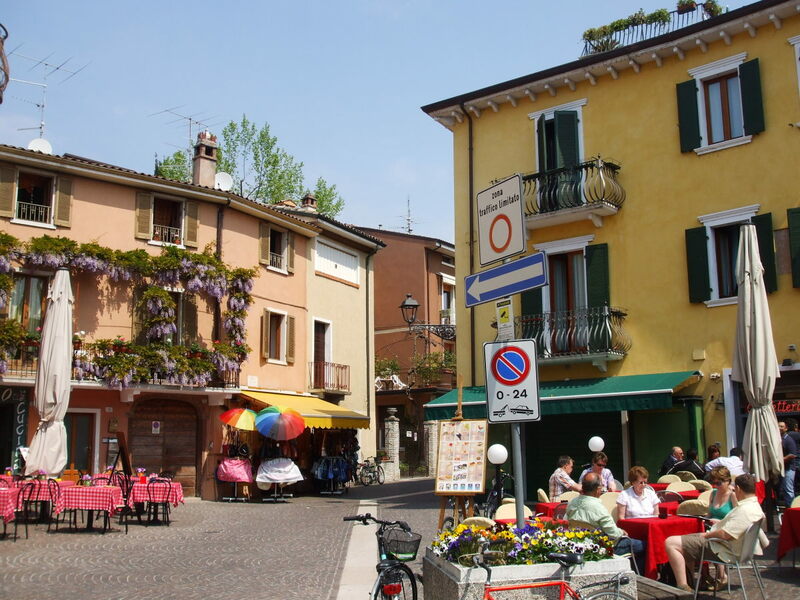 There are lots of things to do in Peschiera and the town also possesses a great advantage logistically and positionally. It has a ferry port, a railway station, regular buses and for drivers it is adjacent to the autostrada. 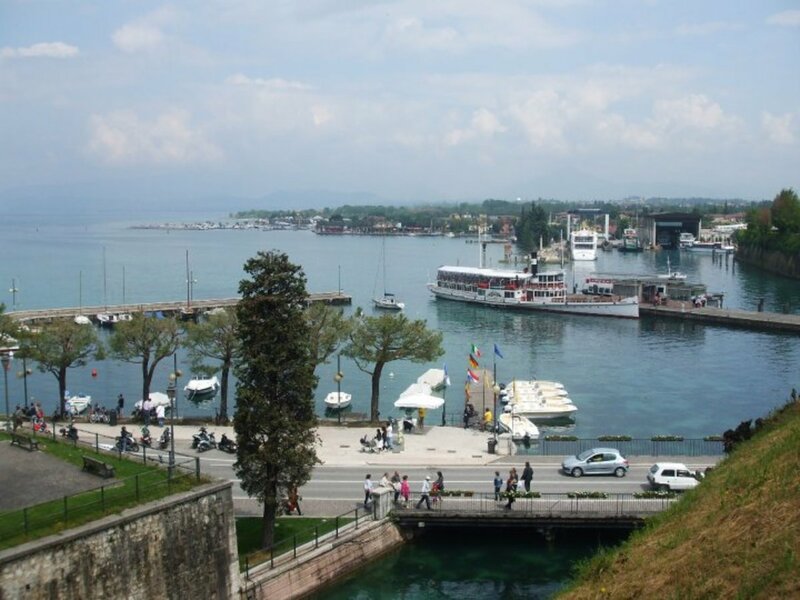 Therefore it serves as a convenient hub for visits to the likes of Milan, Venice and other towns on the lake. It is also only a few kilometres from the main themeparks. Many other parts of the lake are not as well served by communications as Peschiera. Apparently the third best in Europe behind 'EuroDisney' and some other park which came in second obviously. Normal prices are around €36 although they may offer discounts in the evenings for only €10 a ticket after 7pm. There are several rollercoaster rides of varying speed and excitement culminating in the the fabulous 'Blue Tornado' an extremely fast roller-coaster that roars around a mangled course with corkscrew twists and all at high speed with concerted screeching and flailing legs. It has an indoor ride called 'Ramses', which is a Pharoah's tomb with small carriages on rails like something out of Indiana Jones. There electronic guns onboard and the object is to point them at targets and fire to clock up a score. You can also rise up high above the ground and see the surrounding area in the 'Flying Island which resembles more a large flying saucer and if you’re not afraid of heights well worth a look. Although advertised as open till 11pm in high season, on the night I was there the park actually started winding down about 10.30pm with the rides gradually closing one by one which was unexpected. As a grand finale there was some short musical show outside Ramses Tomb which included choreographed, disco-dancing by a line of Pharoahs. Probably one of the most silliest and ridiculous sights I think I've ever seen. Nearby is 'Aqua-Paradise' the best and most popular water park in the area with a tropical island, erupting volcano, a galleon and water galore. There is also the 'Movieland' themepark with hi-tec attractions on Hollywood blockbusters like the Terminator and Police Academy. Inland is the popular Parco Natura safari park, Jungle Adventure for the active and the pleasant, though unremarkable, Parco Giardinó Sigurta for strolling through the flowerbeds and greenery. The little town of Lazise (pronounced La-SEE-zay) has similarities to other towns on the lake such as Pescheira and especially Sirmione in that it was an important military stronghold. The Scaglieri family figure highly again as they built a castle here which has their familiar 'fish-tale' ramparts lined along the fortifications. The name of the town comes from the Roman 'Lasitium' derived from the Latin 'Lacus' meaning 'Lake' leading to the term 'Lacustrine' which means the environment of a lake. Its town walls and castle were built as far back as the 10th and 11th centuries. The front of Lazise has a wide prom and is very flat, so on stormy days when the big waves hit the shore it's fun for all the family. Shallow water flows in about 40 yards, right up to the lakeside restaurants and into the edges of the streets. This happened one day when I was visiting and lots of people began paddling along the prom as it was so smooth to walk on barefoot. Also very refreshing when the waves splashed across the stone. Even patches of the ground were covered in smooth, flat pebbles embossed in concrete which offered the barefoot paddlers the added extra of a foot-massage. You certainly don't need the local 'Aqua-Paradise' adventure park on days like this. Why pay for an expensive theme-park when nature can provide all the fun and excitement you want for free. Lazise is quite commercialised with many tourist shops selling souvenirs and trinkets but it is still one of the nicest places to visit on lake Garda. The name of the town actually derives from the German 'Bardali', the daughter of King Argonauta Auleto. Well! according to some Glottologists, a profession I've never heard of and certainly wouldn't admit to being part of in polite company. It's all to do with linguistics and Philology. The name 'Bardolino' first appears in documents in 807 but it was under the Venetian Republic that the town began to thrive in agriculture and viticulture. It was famous for its wine even during the Roman period and each year they hold two wine festivals one in late spring and another at the end of the summer. Visitors can sample the local wines and enjoy a spectacular firework display at the end of the night. Of course, you can sample its famous wine in the many bars,cafés and restaurants such as 'Ozzo Mezzo' a Fellini-themed bar which has a counter covered in photographs of famous films stars. Many of the streets are wide and pedestrianised offering the perfect environment to wander around and enjoy the fine cuisine and refreshments that this wonderful town has to offer. There are also many historic churches to stroll around and enjoy and even an offshore fountain providing an attractive water feature from the promenade. The hinterland around Bardolino is perfect cycling country and has a beautiful landscape of olive groves and vineyards nestling in lush valleys. 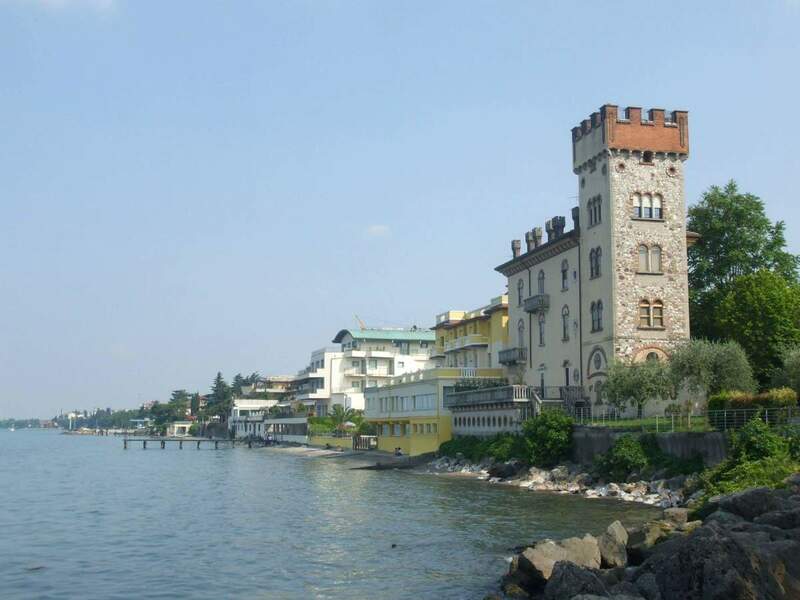 There are many fascinating places to visit in Bardolino and its surrounding countryside. 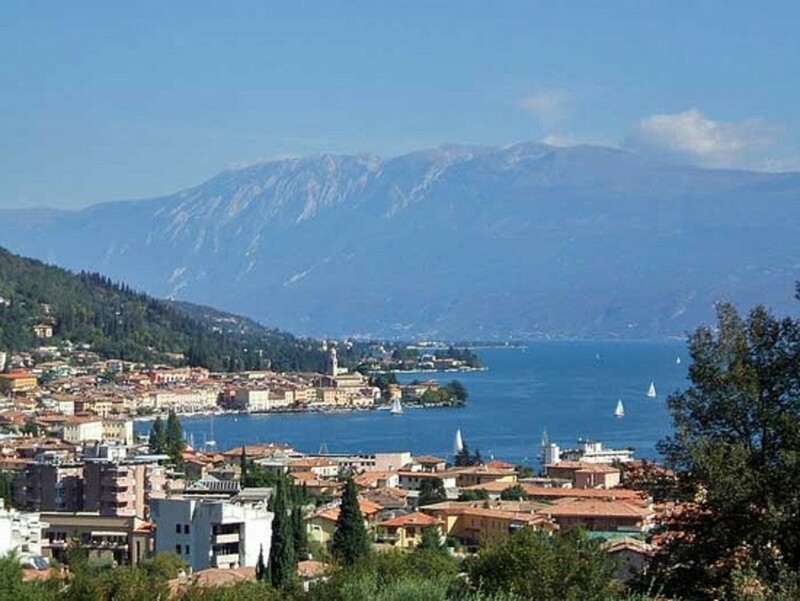 Garda town is only 2 or 3 kilometres further up from Bardolino and one of the most beautiful locations on the lake. It enjoys the advantages of more hilly surroundings surrounding a wonderful bay area which adds to the spectacle. The further north you venture on the east side of the lake the more mountainous it becomes. An important town through the ages and it actually lent it's name to the lake itself as the latter was previously called 'Benaco' in the Latin language. It has a very wide promenade where you can walk or take a seat at the many lakeside cafes and restaurants. At night-time it is a colourful treat to the eyes with many soft lights decorating the scene. Garda is very useful for shopping, not only for souvenirs but also for clothes, art and jewellery with even a little bookshop catering for English language magazines and books. Probably the most mis-pronounced town on the lake but if you want to impress from the start on a visit then a little practice will help. It is pronounced ‘Mal-CHES'Z-inay’ and after a little practice you should have it down to a tee. Situated near the slopes of Monte Baldo, Malcesine is the starting point for a cable car trip up to the summit of the mountain. On a clear day the view over the lake is truly spectacular and the mountain is popular for skiing. Remember to take some warm clothes as even in the summer the temperature can be a little cold at the top. There can be queues, especially in high season so be prepared for a wait for at least up to an hour sometimes. The cost should be less than €20 per person with discounts for children and senior-citizens. It is also a popular area for cyclists, hillwalkers and thrill-seeking paragliders willing to throw themselves off the mountain. The town itself is attractive and busy in the summer with its medieval buildings, cobbled lanes and of course its main attraction the Castello Scaligero which also houses a museum. Another building worth a visit is the grand Palazzo dei Capitani which was the headquarters of the Venetian rulers until the late 18th century. Malcesine is also an ideal town for relaxing with a meal, a drink or even just a delicious ice-cream or two. There are three main squares Piazza Turazza, Piazza Cavour and Piazza Vittorio where you can enjoy a sociable evening dining or just sitting with a glass of wine or a coffee and people-watch. The north end of the town has small pebble beaches for swimmers and sunbathers to enjoy the great summer weather. 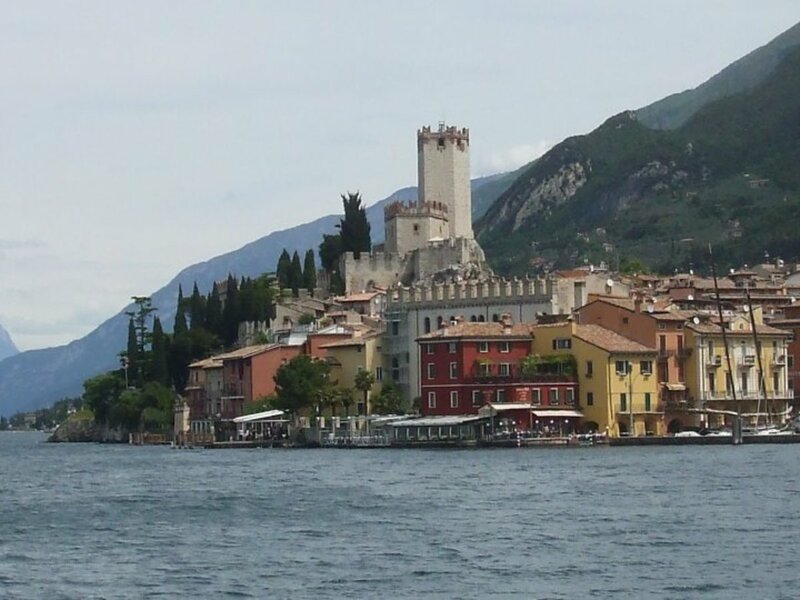 The second largest town on Lake Garda, Riva del Garda is right at the North end of the lake at its narrowest point. Therefore with high mountainous surroundings it is one of the most spectacular parts of the lake and a favoured haunt for hill-walkers and rock-climbers. The town can receive the winds coming off the Dolomite Mountains and so is also popular for wind-surfers, as is the little village of Tombole nearby which is within easy walking distance. A promenade along the lakeside is recommended and it is attractively decorated with abundant and pleasing vegetation. Riva del Garda was part of the Austro-Hungarian Empire until as late as 1918 after the First World War and the Austrian influence is very strong in its architecture and culture. You will find many examples of fine Austrian beers in its bars and cafes. It also has a medieval fortress built in 1508 bounded by a canal and which contains the Civic Musuem with an art gallery and archaeological artefacts. You can visit the the Piazza III Novembre dominated by the Apponale Tower which has the famous ‘Anzolin de la tor’, a revolving angel made of tin which is the symbol of the town. For an admission charge you can climb up inside the tower and enjoy the view over the lake. However, it is free for the more active senior-citizens willing to tackle the 165 steps all the way to the top. 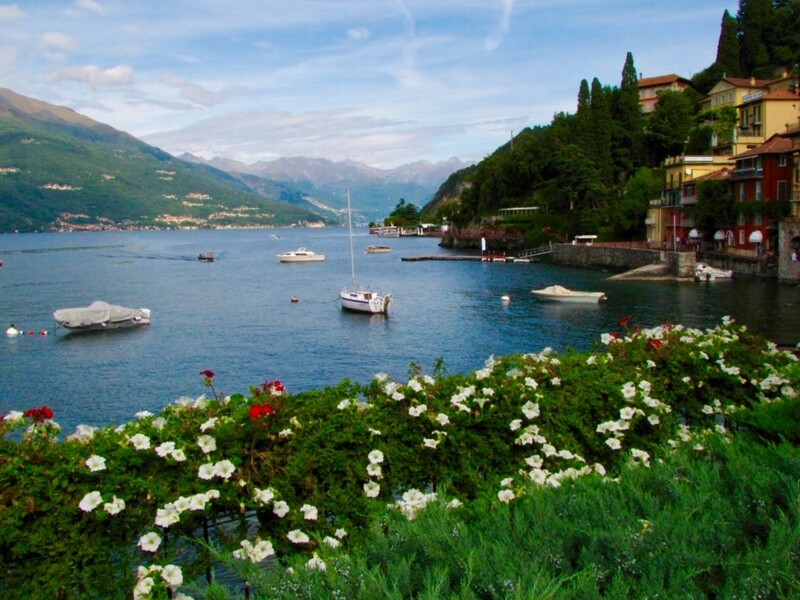 Situated on the north-western side of the lake, Limone is a very picturesque part of the area as the mountains rise immediately behind the town. Although the Italian word for ‘lemon’ is ‘limone’, apparently this has nothing to do with the naming of the town. Despite once being a flourishing lemon and citrus-fruit growing area the name comes from the word ‘boundary’ as it is close to the limits of the province of Brescia. In the churches and shrines of the town you will find references to the missionary Daniele Comboni who was born in the town in 1831 and canonised as a saint in 2003. There are several small pebble beaches for sun-worshippers to relax or swim in the lake. Incidentally, scenes for the James Bond movie ‘Quantum of Solace’ were filmed there in 2008 including a car chase along the lakeside. 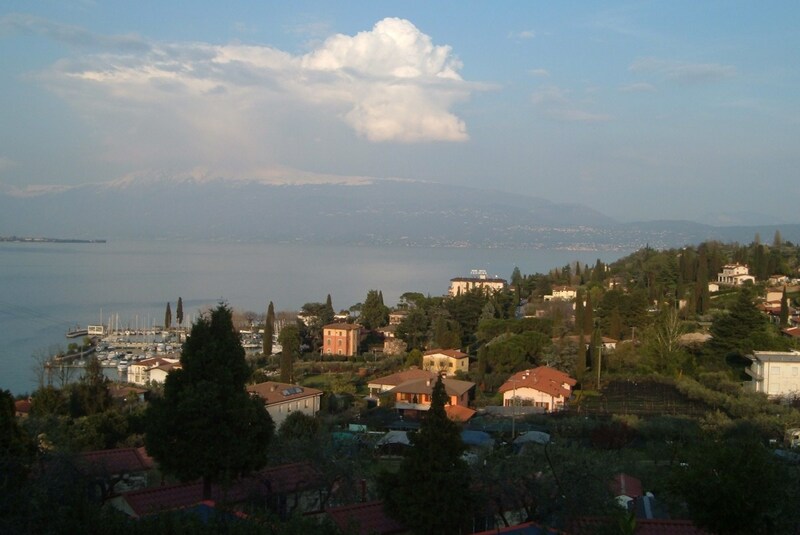 Sitting on the western shore of the lake, Gardone is a small town and dominated by tourism. Its most famous attraction is the Vittoriale degli Italiani, the home of the poet Gabriele D’Annunzio and which displays the eccentricity and flamboyant excess of this remarkable man who died in 1938. Visits are by guided-tours only and in small groups so you may experience queues. Also worth a visit is the Heller Botanic Garden named after artist Andre Heller who has various works of modern art dotted around the flora and fauna. The gardens were actually founded by a man called Arthur Hruska who as well as being a keen botanist was also the dentist to the last Czar of Russia. He spent decades developing the collection of exotic plants from around the world from 1910 until his death in 1971. The gardens are landscaped with streams, gorges and artificial lakes and has an admission charge for entry. The town of Saló is on the south-western shores of the lake in the shade of Monte Bartolomeo and situated in a small gulf. It was founded in the Roman period and named Pagus Salodium. However, in 1901 it was almost completely destroyed by an earthquake. The inventor of the violin came from this town and was called Gasparo Bertollotti, born in 1540, who ever since has been known as Gasparo da Saló. It was also the location of the summer residence of Italian dictator Benito Mussolini and the capital of his Italian Social Republic from 1943-45 from where he administered. 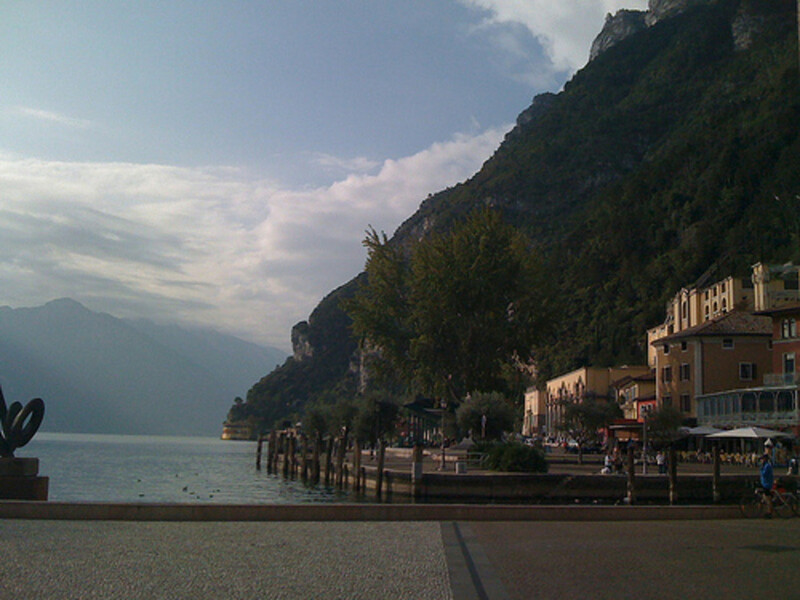 The town has the longest promenade on Lake Garda and perhaps even the longest in Italy itself and is lined with many pleasant cafes and restaurants. Salo is also the perfect place to visit for sporting types as it offers fishing, surfing, rowing, tennis and sailing on the lake. There is a popular market held on Saturday mornings. Ending this narrative excursion with the southern end of the lake, if you can imagine a scene from the Elven Land in Lord of the Rings' then you'll get the idea of the scenery from the south-east corner facing the town of Portese. I was there in springtime where it was sunny but early enough in the season that there wasn't a heat-haze obscuring the faraway Dolomite Mountains. They were topped with just a sprinkling of snow and with the occasional flash of sunlight from otherwise invisible cable-car windows too minuscule to see as they carried people up to the peaks of Monte Baldo. Behind the mountains were deep gorges which gave way to more mountains in ever lighter shades of watercolour grey that stretched into the distance. In the foreground were the small towns and isolated villas beaming brightly in their painted pastel colours. Here and there a chimney would release some white smoke that mingled effortlessly with the occasional low lying clouds that would float past. 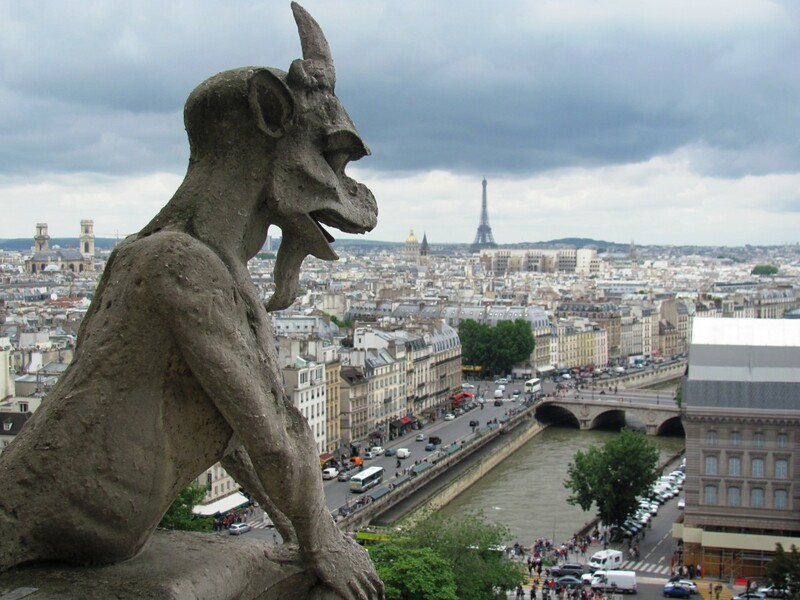 Church bells would toll adding a poignant note to the splendour of the fantastic view. And of course Lake Garda itself shimmered in the sunshine of mid-afternoon, a calm expanse of azure blue reflecting clear skies above and only slightly disturbed by the ferries and motor-boats navigating their way across the water. Portese itself is a very small and quiet town with a little harbour that welcomes the lake ferry boats. Unless you have a car then staying there has the disadvantage of poor communications as it is far from the main road and rail links. But it is ideal for a short stopping off point for a snack or a meal on your way around the lake and to take in the view. Can you easily get between towns without a car near Lake Garda, Italy? Maybe not at weekends and public holidays. The traffic can be bad for the buses as well as cars. Many folk ride two wheels to get around. Which town is closest to Verona? 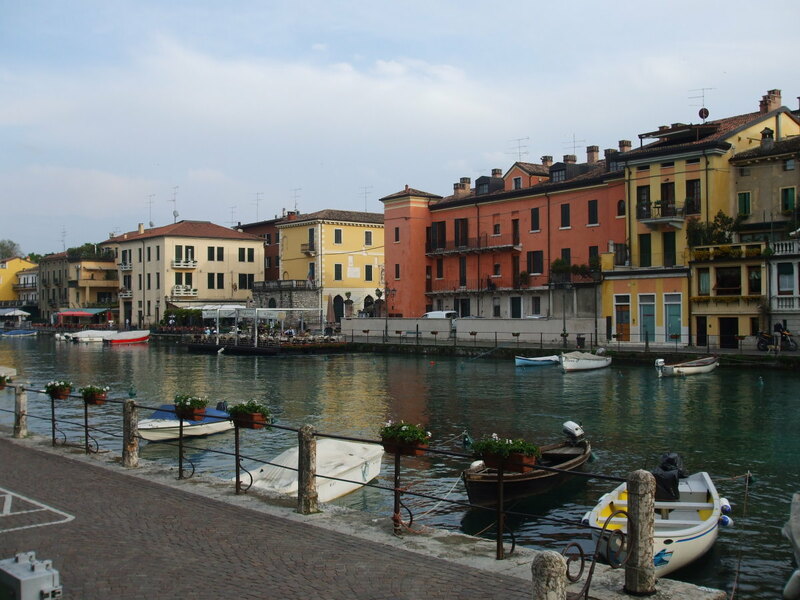 Peschiera del Garda is closest to Verona; it's less than 20 minutes by train. Although, the station in Verona is not in the center of town. My partner and I are in our late 50’s. We enjoy walking in the hills. Which town on/near Lake Garda would you recommend? 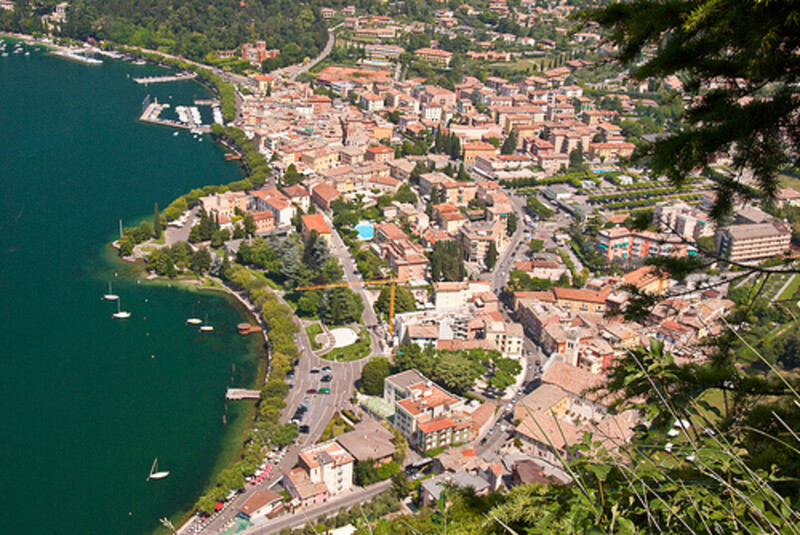 In the north, Riva del Garda is the best for hill-walking. Over in the south-east, Salo has nice walks. 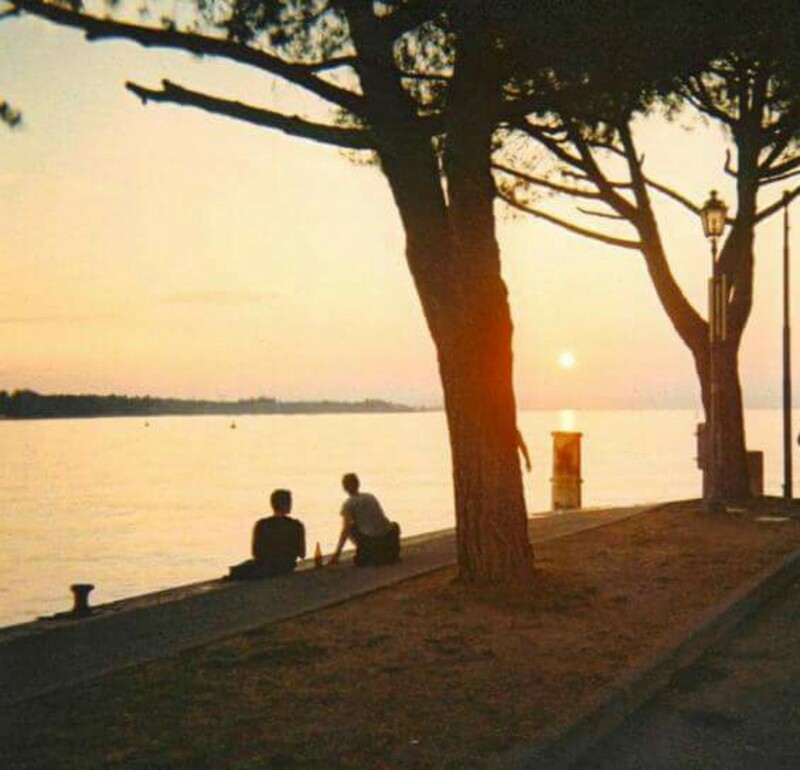 Is Lake Garda safe for the solo traveler? Is it recommended to hire a car to visit Lake Garda? Yes. That would be useful to drive around the lake and venture to other towns in the hinterland. But avoid weekends and public holidays. Traffic can be an absolute nightmare then. Which town near Lake Garda in Italy would you recommend to stay for a bike holiday? South of the lake in Peschiera or Desenzano. Eastside at Bardolino. Will the towns around Lake Garda be closed mid-December? No, but obviously business is scaled down during the winter. In your opinion, is Lake Garda a place that a teenager might like? Of course, without knowing her interests, but in general. The southern part of the lake has a general appeal for youngsters. Theme parks, water parks, water sports, bars, clubs and shopping. We are a middle-aged couple touring the Lake Garda area in mid-December. 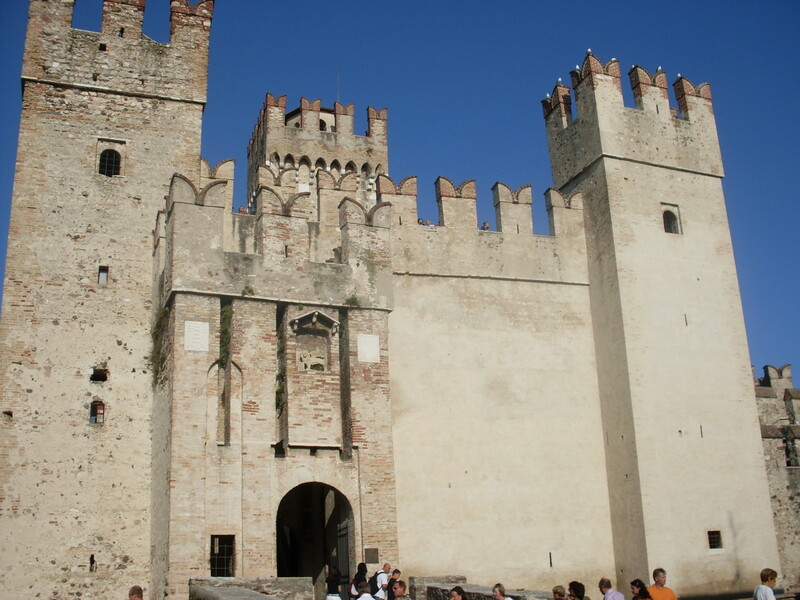 How many of the Lake Garda tourist attractions will be open or will the small towns be closed? You can check the websites of the tourist attractions for availability. But certainly, the major ones should be open. 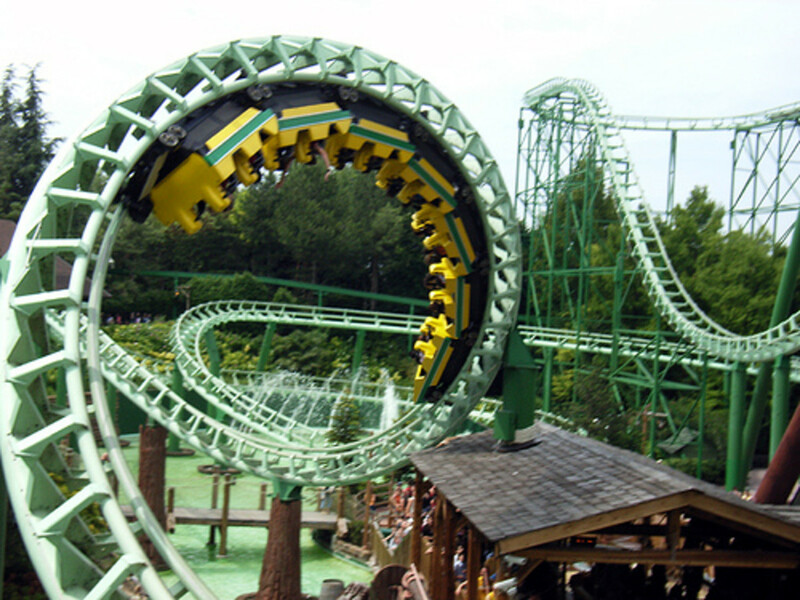 Gardaland is open for example. Hello applejiuce, the lake is certainly beautiful with lots of interesting architecture and history. Thanks for commenting. i want to visit here so bad! the architecture around the lake is beautiful. thank you, i will be keeping this for later reference. I had a great holiday in Garda Town in the early 90s, and this just brought it all back to me. Thanks for posting. What a great hub and one to bookmark into my Armchair Travelling slot. Hi Lady_E Thanks for your best wishes and kind words. I hope you do get there some day as I'm sure you would enjoy it so much. I can't wait to go back again for a holiday. Wow! What a beautiful place to live. So many beautiful Towns. I've heard a lot about Italy but this Hub is comprehensive and gives/shows a lot of useful info. I hope I get to visit some day - it's only round the corner'ish. lol. Salo would be a nice place to start. Great hub Shinkicker, I keep meaning to take a trip up to Lake Garda just having the time. I know what you mean about Italy being such a rich and interesting place, I live in Umbria and its just packed with things to see. Thank you very much for your guide, it is the most useful thing I have found online so far for lake Garda. Myself and my girlfriend are spending a week there in August (in Limone) and have been considering forking out to hire a small boat for the weekend whilst we are there. Limone tourist information say we can moor the boat for free there, but I just wondered if you knew if this was the case in most of the towns around the lake, as we would like to be able to hop off and look around. I am just worried that we will pay a fortune for a boat that we wont be able to get off until the end of the weekend. Also they say they have floats we can moor to, do you think they mean buoys or a floating walkway, as I don't know how we'd get from the buoy to the shore. Thanks for any help you can offer. I would recommend it Jill, It's a fantastic place, it has everything. Wow! Your description of the place made me wish I could go and visit. I do hope I will have a chance to do that one day. Thank you very much for this virtual tour Shinkicker. Thanks too for joining my club. I'm looking forward to going back, it's a wonderful part of the world. I hope you enjoy your return to Lake Garda. I book-marked this in case we ever get to go back there. We stayed at a camp site there,once Euro Camp once with our own tent. The scenery is beautiful and the lake lovely. I recognised some of the places in the photos so thank you for sharing this. Thanks for your comments ASHWINSPGA, that's very kind of you to say. I certainly enjoy writing about my travels and I agree with you that Italy is a fantastic place. Been to Italy twice. Naples both times. It's a beautiful place for one to go and sightsee. The place is frozen in time. Lake Garda looks amazing.Dolomite Mountains caught my breath and i would love to visit given a chance. Dot1122 is right. your hubs provide way more info than the usual guides. Do you do this for a living? If not you should consider taking the job up. Its guarenteed success for you.cheers man. you got a new fan. Thanks Dot, it's a fantastic part of Europe. Very nice hub. A lot more information in it than in Travel Guides. Sounds like a lovely area. 9 years ago from Southern Ca. Isn't lake Garda home of Villa d'Este? If it is - every summer the Villa takes on a worthy new artist and shows the works to one of the world's richest audiences.